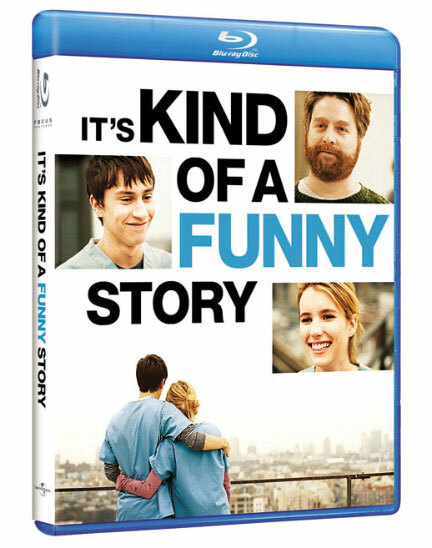 Universal Studios Home Entertainment has announced it will release the coming-of-age comedy “It’s Kind of a Funny Story” on hi-def Blu-ray Disc, DVD, and as a digital download on February 8, 2011. The film was produced by Focus Features and released to theaters nationwide in October of 2010. The BD-50 Blu-ray Disc will be formatted in 1.85:1 widescreen aspect ratio at 1080p video resolution and Digital Dolby 5.1 for audio. Total run time is 1 hour 41 minutes. Extras include deleted scenes, the production featurette “A Look Inside: It’s Kind of a Funny Story,” and a slideshow of the “It’s Kind of a Funny Story” premiere in New York City. Bonus features on the Blu-ray Disc release include BD-Live, pocket BLU (with Advanced Remote Control, Mobile-to-Go, Browse Titles, and Keyboard entry), My Scenes, and uHear. Zach Galifianakis (The Hangover) plays opposite young stars Keir Gilchrist ( United States of Tara) and Emma Roberts ( Valentine’s Day ) in the Focus Features film It’s Kind of a Funny Story , a smart and upbeat comedy about life, love, and the pressures of growing up. Craig (Gilchrist) is a stressed-out teenager who checks himself into a mental health clinic for a little time out. What he finds instead is an unlikely mentor in Bobby (Galifianakis), a potential new romance with Noelle (Roberts), and the opportunity to begin anew. Written and Directed by Anna Boden & Ryan Fleck.